When we watch surf competitions on television, we see the waves from a distance. Despite great advances in technology to bring us ever closer, we cannot see what the surfer sees when looking up. A great writer can take the reader by the hand. Therefore, if you pick up Barbarian Days: A Surfing Life, by William Finnegan, be prepared to see the sport in a new and piercing light. Having married a surfer, and having just crossed the thirty-seven- year mark, I can report that most people have the wrong idea about this breed. Based on silly movies, whose makers insisted on dopey characters, the mettle of the man who accepts the challenge of surfing had not been fully articulated. Not until now. 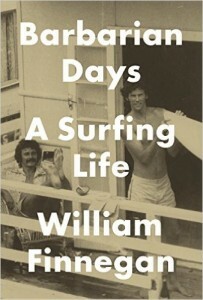 If you love a surfer, you simply must give that person this book. William Finnegan, a staff writer at The New Yorker, and esteemed journalist, has created a memoir that I venture to state will never be surpassed. The time he covers, from his youth in Southern California, to Hawaii and then to the spots around the world that where the best breaks can be found, will not come again. With the Beach Boys and the Gidget movies, even girls growing up in Toronto, Ontario, were pea green with envy about the surf culture of California. It was a different story when I tried to take up the sport myself. A wave of four feet in height appeared enormous from the trough and been thrashed by one feels like an entirely bad idea once you are under the overhead washing machine. I decided to stick with my love of swimming and remain close to shore. I learned a lot about the culture in my salad days while I hung out on the beaches of San Diego and listened to tales of daring. Having grown up surrounded by the world of hockey, I knew about toughness, I knew about courage, and I knew all too much about hero worship. The flaky, airhead hapless teen, so often featured as part of the culture, bore no bearing on the guys I knew. To me, they were every bit as gutsy, fearless and brilliant as any men I had ever met. Hockey players, off-ice, in my experience, at least, were full of fun, gallant, sweet, kind and nice. Surfers were mercurial, often silent, cold and distant. We could jolly them along, and our friends were full of wonderful humor, but I noticed the younger surfers, the ‘grommets’ who followed them around were too afraid to say a word. We listened to endless descriptions of breaks, rights, lefts, gnarly, mushy waves, closed out waves, glassy days, and every nuanced condition at Scripps, Wind and Sea or Blacks in La Jolla. I enjoyed every minute of these tales because the ocean is a dangerous mistress. Nothing, and I mean nothing, would come between these guys and their first love. This is the world Finnegan describes with such expertise and beauty that I felt transported. A big wave rider, he impressed me to my toes. I could picture every wave perfectly, and the line he constantly pushed between the wave that could kill you and the wave that could make you weep makes this the best adventure story I have ever read. I could gush on and on, and readers will have to forgive my fangirling here. Ever since I first saw those big wave surfers on Wide World of Sports, all those years ago in Toronto, I have known that surfers are men of exceptional courage. Mid-way through Barbarian Days, I knew we were going to hit surfer depression land at any moment. It is present in every surf movie, for the time will come when decisions have to be made, and comprises will be required. Dilemmas common to all risk-takers will be staring them in the face. The balance is as tricky as the ride itself, yet it can be done. As a reader, we pull for Finnegan through every phase of his life. People smiled when I said I was dating a surfer. Some of my friends said with disdain, “Oh Liz.” Lots of people thought our marriage would flame out. Everyone waited for me to return to my senses. Not so my grandfather, the consummate hockey man, a war hero who judged everyone by their toughness. He had utter contempt for a lot of the men my sisters and cousins dated. My husband came through unscathed. It was decided all at once. He passed. Hero worship, plain and simple. 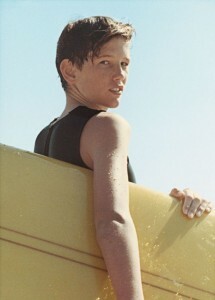 Barbarian Days: A Surfing Life tops every chart I have to top. Take this book to the beach. This entry was posted in Memoir, Uncategorized and tagged La Jolla, Memoir, Surfer, surfing, The New Yorker on August 20, 2015 by Elizabeth Smythe Brinton.